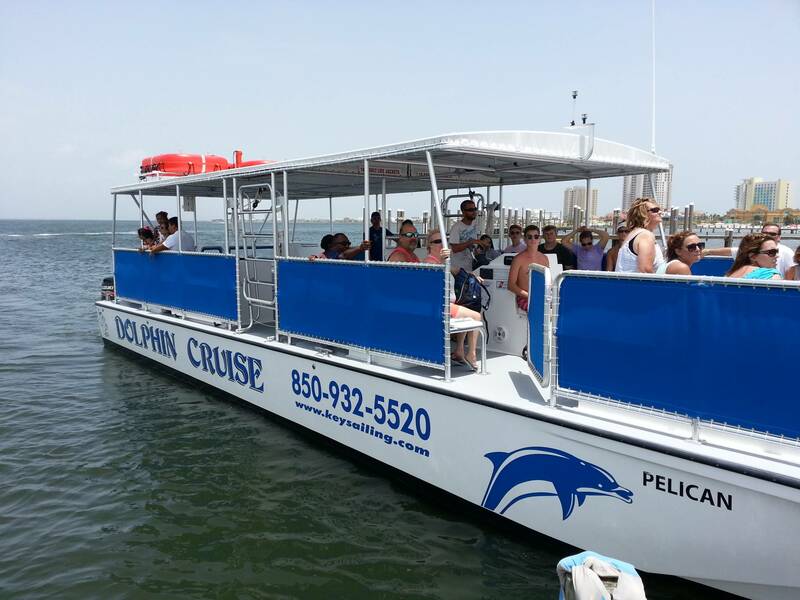 Now booking online for Dolphin Tours on Pensacola Beach!!! She has a 4' x 9' glass bottom view panel in the starboard hull. The price for one of our Dolphin Cruises in $25 per adult and $15 per Child. If you are bringing an infant on-board, please call the shop at (850) 932-5520 so we can adjust our manifest. If you do not call prior to your arrival, you will be charged a child's ticket for any infants. Key Sailing offers many types of scheduled tours on the only boat with a glass bottom view panel operating out of Pensacola Beach. Our boat is a brand new 45 foot Catamaran tour boat with glass bottom panel made by "Corinthian Catamarans" there is a bathroom on board for your convenience. We have bottled water on board but feel free to bring any other food and beverages you would like. We Also have Blue Angel air show tours. Avoid all the traffic involved with trying to go watch the show on Pensacola NAS. We will take you to watch the show from the water, this is by far the best vantage point to watch the air show. The Blues will be flying right over head!!! We will look for Dolphin and other wild life to and from the show!!! Dates with space available on the Pelican are shown in green, choose a date and then a time and number of tickets needed. ’19 OUTBACKS have finally ARRIVED!! !